Welcome to "Hey Mom, I'll Start Dinner" web site. I hope you are here for the same reason I am. You are passionate about raising great kids and have found making kids a part of meal time to be an incredibly valuable way to help achieve your goal of raising confident, contributing, unselfish kids. 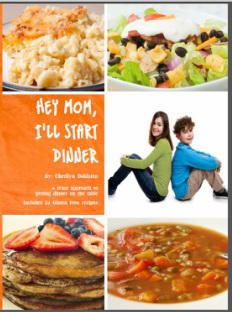 I hope you will read the introduction in the cookbook to learn more about why that is and the research that has backed up what I stumbled onto as a parent. My blog, rather than being mostly about cooking, is mostly about this working mom's attempts to buck the culture that tells our kids it's all about them, and instill in them an understanding that they are a gift here to be a blessing to the world and to make it a better place. If this is something that resonates with you, please join me on that journey to put wonderful theory into practical, on-the-ground parenting. On the site, you will find more recipes, downloadable templates to customize your own family favorites and how-to videos to help our kids learn the vital skills needed for confident cooking. May we inspire one another as we help our kids become all they are meant to be.